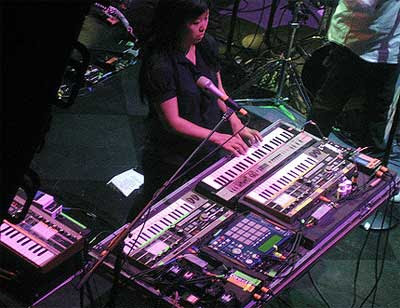 While watching LCD Soundsystem (on TV) supporting Daft Punk in Hyde Park at the weekend, I was totally distracted by Nancy Whang's mighty table of keyboards. She plays two MicroKorgs (and the bass player has another), a Casio MT-400V, and an MPC1000 (what do you think, could the blue be starting to look cool?) The other boxes just seem to be DIs and a A/B switch. She also has a Moog Rogue around the corner. Splendidly, the drummer had an old Simmons pad in his kit. More on LCD Soundsystem live here and here. Who wants to bet JJ OS is on that baby? The MPC blue's been cool from the get-go. Kinda neat to see James & co championing the Microkorg - despite its fast-approaching dime-a-dozen, unhip status, it's a pretty fun board. Damn, I was really hoping they had a new keyboard player. I saw them play in Chicago a couple years ago, and she actually rolled her eyes when she realized they were playing a second song as part of the encore. So, Daft Punk were playing further up the bill, further up the bill? I honestly don't care if they use a table full of VL-1s and duck-calls: any band that does special workout mixes for Nike have achieved the kind of moral bankruptcy you usually have to release an album through Starbucks to achieve. "she actually rolled her eyes when she realized they were playing a second song as part of the encore." did you read her mind? perhaps she had just been told by some synth geek that she has wonderfully small, but perfectly formed micro-korgs. isn't sonic youth doing an album for starbucks? i'm uninterested in lcd soundsystem too, but not because they're "morally bankrupt" - just because they make really boring music. pretending that music has any connection to "morality" or "truth" is pretentious and off base. it's music. i wish i had written a workout tape for nike. then i'd be writing this post on a solid diamond laptop on my coffee table made of yamaha gx1s, instead of my freaking aluminum powerbook and my coffee table made of cz101s. "my coffee table made of cz101s"
I did see the thing on sonic youth, and strangely i was less surprised by that than the LCD thing and I still can't tease out the reason why. Perhaps because it was over 15 years since they were interesting? it's funny, i always roll my eyes when i see a band with a microkorg. it's almost becoming a mark of generic, uninteresting music. to see a band (lcd) that i think epitomizes generic and uninteresting music with (count them) THREE microkorgs brings a warmth to my cold anonymous heart. What happened to just liking catchy music for the hell of liking catchy music? It's a shame that bad music and commercialism seem to intersect so often, but that doesn't mean that commercialism is the mark of bad music. That would be a Casio MT-400v that she is playing - has much nicer action than the microkorg too! I've got a Casiotone that can handle more than 4 notes. Last christmas I was at my parent's house and found an old box of photographs from around 1997. In it was a photo of Nancy Whang and I sitting in a coffee shop. This was long before she got cool! I won't tell you how nerdy the situation was, but I'll just say that out of the two of us, she totally chose the correct career trajectory. Now I read blogs about synthesizers, whereas she appears in blogs about them. Congrats!!! why so much hatred for LCD soundsystem? And all of you moaning about artists selling out, well I'm sure if you got the chance you would stick to your guns and be a poor suffering artist. Its those commercial deals that give artists the freedom (money) to be creative. Cos sadly the creative/artistic stuff doesn't always pay the bills. I really like LCD Soundsytem, and I really like the Nike Run track/mix he did. It's not exactly like when Neptunes did 'I'm lovin' it' for McDonalds, is it? "I honestly don't care if they use a table full of VL-1s and duck-calls: any band that does special workout mixes for Nike have achieved the kind of moral bankruptcy you usually have to release an album through Starbucks to achieve." Ah, I love the smell of condescension in the morning. How's the view from that ivory tower? maybe if james murphy (lcd ss) was a starving artist we could cut him a bit of slack for working with nike. but as he is signed to a major label with at least a $500k+ per album deal, tour support and licensed tracks on everything from x box games to the sopranos, i think its more than fair to call him morally bankrupt. I don't know guys. I'm not tryin' to stereotype but uh...who cares??? I though this was meant to be about MicroKorgs? Why does she need more than one? Maybe she wants to play 12 notes at a time. Er....with her toes or something. For my money the MicroKorg's dime-a-dozen status will make it the sought-after vintage classic of 2027. Roland 303s were a dime a dozen in the mid 80s. @Falling Man "maybe if james murphy (lcd ss) was a starving artist we could cut him a bit of slack for working with nike. but as he is signed to a major label with at least a $500k+ per album deal, tour support and licensed tracks on everything from x box games to the sopranos, i think its more than fair to call him morally bankrupt." really? 500k?... do you think this is the 90's? I'm sure james murphy isn't hurting for cash, but they're still only playing venues like brixton academy and selling like 80, 000 copies (IF that). you don't know what you're talking about and indeed you're unbelievably out of touch.